These math worksheets cover multiplication for kids just learning how to multiply. For those of you that are beginning multiplication lessons with your child, prepare for frustration. It seems like they just mastered addition and subtraction not that long ago. Build upon their addition skills by explaining to your child that multiplying is a simple way of adding the same group of numbers over and over again. This is called "Repeat Addition". For example, say you have four groups of cupcakes as pictured below. Yes, you could just multiply 4x2, but children that just learned how to add will find this confusing. They will tell you that 4x2 is 6. Seriously...every time. Multiplying by adding helps to bridge the gap between the two and may help your child to better understand the process of multiplication. 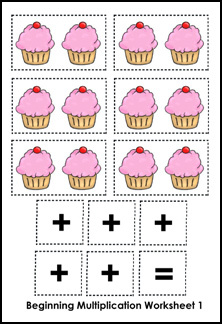 Practice this concept by downloading the multiplication worksheet below and cutting apart the pictures. 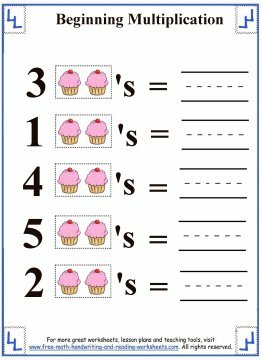 Allow the student to lay out several different combinations and then count aloud together the number of cupcakes. Be sure to point out how many groups of two you are adding together. For example, if your child sets out three pictures, you are adding 2 + 2 + 2. But, you want to make sure that your child understands that you are adding 2 together 3 times. Then show your child how that would look as a multiplication problem--3x2. 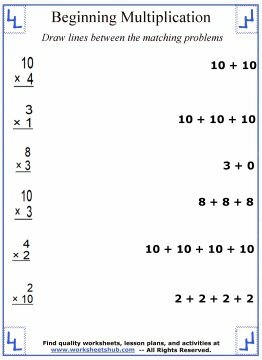 The next worksheet will introduce simple multiplication problems to kids. Use the cutouts from the previous paper as a visual aid to help solve the problems. For example, in the first problem you have 3 X 2. 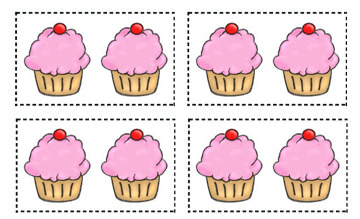 Have your child set out 3 of the cupcake pictures, count them out--2 + 2 + 2 and then write the answer on the line. Again, be sure to explain that another way to say 2+2+2 is 3x2. Confused yet? I know. It was crazy hard to teach our son about multiplying. We still have two girls that haven't even begun to add yet. We're in this together. 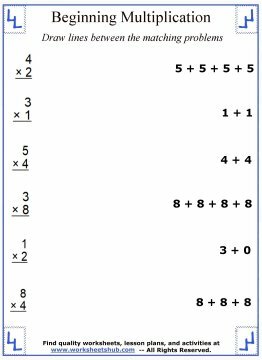 Use the worksheets below to reinforce the concept of multiplication being a quicker way to add. In the left column there are multiplication problems. On the right are the same problems written as addition problems. Draw a line from the problem on the left, to it's match on the right. 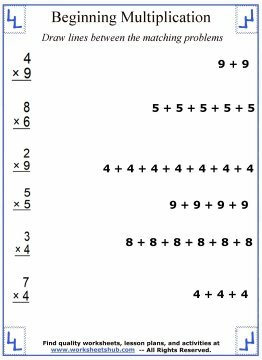 There are many more multiplication activities for kids to check out. See the links below for more resources.